How to bring this horizontal loop to resonance on 160m? Discussion in 'Antennas, Feedlines, Towers & Rotors' started by 2E0ILY, Mar 25, 2019.
feeder length to perhaps bring it into resonance please? hat" on LF only. I now want to unstrap the window line feeder and resonate it on top band. The analyser shots seem bizarre but I calibrated it before I started. 3 shots, one at the shack end of the window line feeder, no balun, one same place with 4 to 1 balun, one same place again with 9 to 1 balun. Comments greatly appreciated, thanks. How long is the feedline? 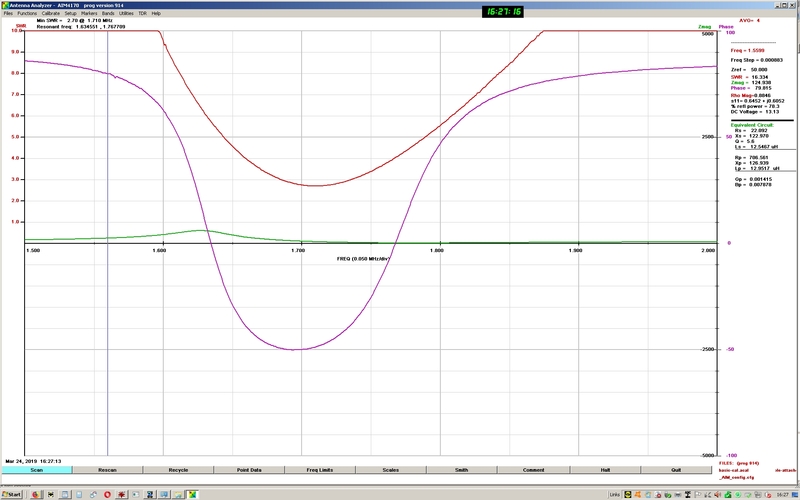 Pretty hard to argue "resonance" with a hi Z balanced feedline. The idea is the high SWR conditions will not give much loss in a high Z line and then use a good balanced input tuner that matches Z to rig in shack. This makes more sense when you try to use the ant on multiple bands ! I have a FW loop up horiz for 40M and used a Q section of 75 ohm Coax between the feedpoint of the loop and 50 ohm coax to the rig. That got me to a very low SWR. 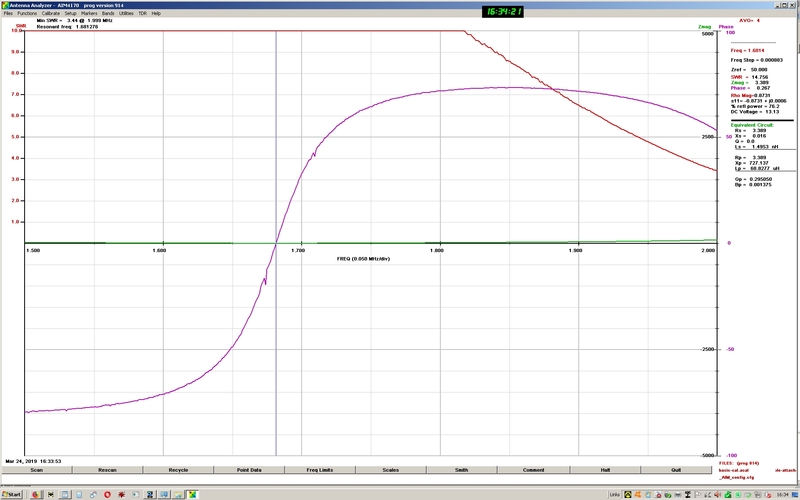 I used the formula... Wire L (in Ft) = 1004/F (in MHz) to get the wire length of the loop. Is low SWR the actual concern ? Another thought , on the lower bands you will be a small fraction of a wavelength above ground (usually) and this will lower the effective frequency of any wire antenna and you will have to shorten the total length of the loop by some amount to get the operation freq back up. It was easy to do this with just a SWR meter on my system , with the Q section Z matching and Coax feedline. 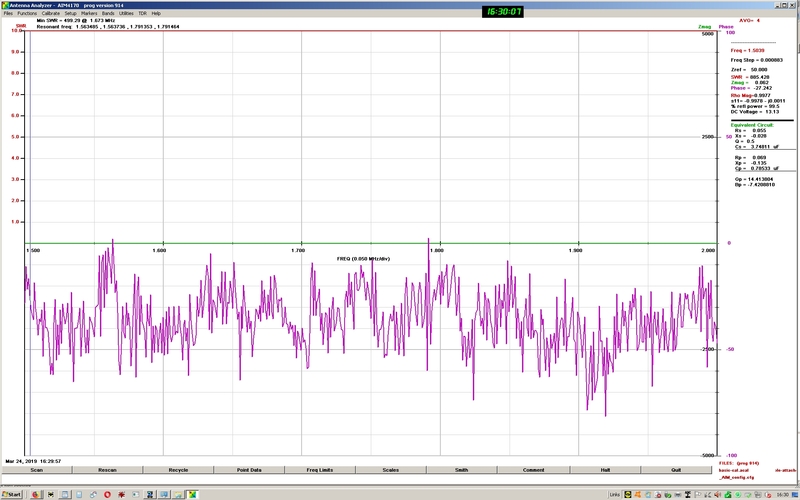 Your screen shots make no sense with no freq scale showing. I had to magnify them, and then I saw the freq scale, looks like the wire is getting the ground effect and has to be shortened ! Just like I mentioned in my other comment. Corner window line fed horizontal ? Do you want Cloud warmer ? A change in feed point can make a lot of difference. I would try center fed, To match the direction that you want your signal to go. I just use coax to feed my 1 wavelength loops. Works great for me, Feeding in the center of one side. Your best guess as to the overall height of the loop? Your best guess as to the total length of wire in the loop? Where is the loop fed? Corner or side? Can you post ANY Rx/Xcl at a frequency? The graphs are hard to read. If you had matching setup / coil before you must have calculated it from some data , right? Perhaps you could start with a model to get the impedance you need to match. About 35 feet, hangs in a slack loop, down from the corner then looping up to the 1st floor shack window.